Hormones are pretty important; that’s why we talk about them a lot around here. Below, contributor Danielle tells us how to naturally balance hormones using seed cycling. Seed cycling, also called seeding, is using specific seeds to help balance a woman’s menstrual cycle and hormones. The seeds promote hormones which should be produced during the respective parts of a cycle and thus help to create hormones when the body may be lacking or off-balance. Women’s cycles historically revolved around the lunar cycle– the path the moon takes each month from the new to the full moon. (source) Women’s cycles are designed to begin on the new moon, leaving them ovulating on the full moon. However, modern lighting and lifestyle have swayed our rhythms to an unnatural cycle. During the two main phases of the month, you can consume healthy seeds to promote the proper hormones during that time of the cycle. This phase starts when your period begins and ends when you ovulate. This will be days 1-14/15 of your cycle. This phase begins when you start ovulating and ends when you start your period again. This includes days 15/16-28/30 of your cycle. Everyone’s cycle is a little different, so the days will be specific to your cycle. The average menstrual cycle is 28 days long (the time between the start of one period and the start of the next). Flax seeds promote estrogen production, which is the hormone that is dominant in the follicular phase. 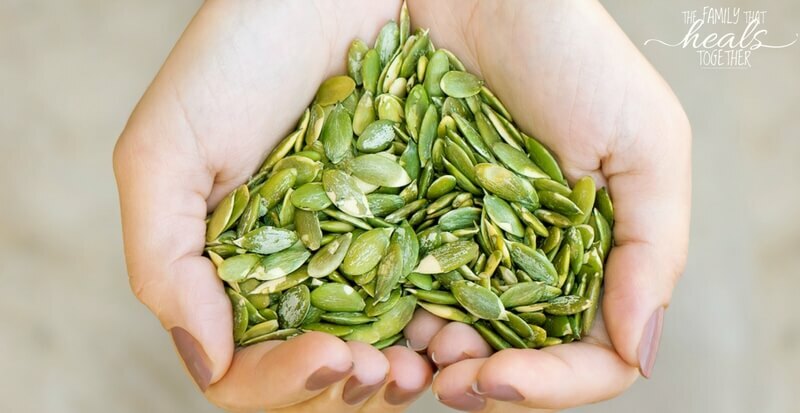 Pumpkin seeds also promote estrogen production. The natural estrogen-promoting substances in flax and pumpkin seeds help prepare the uterine lining for implantation, bringing the estrogen levels into balance (and fertility up!). Sesame seeds promote progesterone production, the dominant hormone of the luteal phase. Sunflower seeds also promote progesterone production. Learn more details on the science behind seed cycling. Be sure to get raw, organic seeds, and grind them well before consuming, either in a mortar and pestle, blender, or by chewing well. Adding your seeds into your daily consumption may be hard to remember at first, but will become second nature. Take 1-2 tablespoons of flax and pumpkin seeds daily. *Taking omega 3 supplements, such as extra virgin cod liver oil during this time, and an estrogen-promoting tincture during this phase may also help. Take 1-2 tablespoons of sesame and sunflower seeds daily. *Taking evening primrose oil, and a progesterone-promoting tincture during this phase may also help. But what if you have an irregular cycle? If you don’t have a regular cycle and have no idea when your cycle should start, don’t worry, there’s a built-in start mechanism- the moon. Start your seeding cycle as “Day 1” on the next new moon, and change to the next seeding cycle as “Day 15” on the full moon. Seeding is beneficial for those without a period (amenorrhea), and those going through perimenopause, menopause, and even postmenopause. It may take a few cycles for your periods to become regular and for you to see changes. I would encourage the use of a cycling journal to track your symptoms and continue to cycle for at least four cycles before determining it isn’t right for you. Thanks to loads of hormones in our food supply, a busy lifestyle, hormone disruptors in our beauty and home products, and nutrient-lacking food, many women suffer from hormonal issues. Hormones are produced in the liver and manage the majority of the body’s systems. They are responsible for sending information from one part of the body to another, such as to tell you when you’re hungry and full, cold or hot, sexually interested or… not. Hormone tests are available at most obstetrician and physician’s offices (and would be covered by insurance), although I would suggest taking a more natural and comprehensive approach. A newer test has recently emerged called a DUTCH hormone panel, and is offered by more naturally-minded care providers like naturopaths and functional medicine doctors. Many gynecologists and physicians will prescribe birth control to correct menstrual issues and irregular cycles, but birth control contains synthetic hormones that are potentially damaging to your health. Reduce stress. I know this can be hard to do, but it’s pivotal. Cancel commitments, look for a biofeedback doctor in your area, rearrange your schedule, and book exercise, reading, and rejuvenation time for yourself. Look into homeopathics (find a homeopath in your area that understands homepathics by lunar cycling). Sip on teas that promote a healthy cycle, such as this one with raspberry leaf and nettle. Use herbal tinctures that are also cycling, such as phytoprogest and phytoest. Eat a whole foods diet, focusing on grass-fed meats such as beef liver and wild-caught fish, and organic raw vegetables and fruits. Limit non-organic dairy and meats as they may contain added hormones. Tone up your liver by sipping on dandelion tea or doing a gentle liver cleanse. Take a high quality probiotic, like Gutpro, to heal your gut. Revamp your sleep lighting: remove all artificial lights from your bedroom, and stay away from computer and phone screens for at least an hour before bed. Sleep in total darkness most days, and sleep with a light (from the moon or in your room) for three days around ovulation, mimicking the moon’s patterns. It’s estimated that 50 million women in America are dealing with hormonal imbalance, greatly reducing their quality of life. Seed cycling is a natural way to balance your hormone levels without synthetic hormones that can wreak havoc on your health. For more information, check out the links, books, and testimonials below. Happy seeding cycling! Thank you! My daughter is 19 and is currently struggling with strong irregular heart beats and has not had a period in 8 months. Taken her to hospital twice thinking it’s a heart issue ?!? Doctors say they think it’s hypothyroidism. I don’t understand why her heart beasts so fast if it’s hypo. Without having a thorough thyroid panel done with a functional medicine doctor is your best bet, a the thyroid tests done by most doctors are not sensitive and accurate enough to really get to the bottom of the issue. If I’m post menopausal, can I start seed cycling anytime? I just started three days ago, and it was not the new moon.